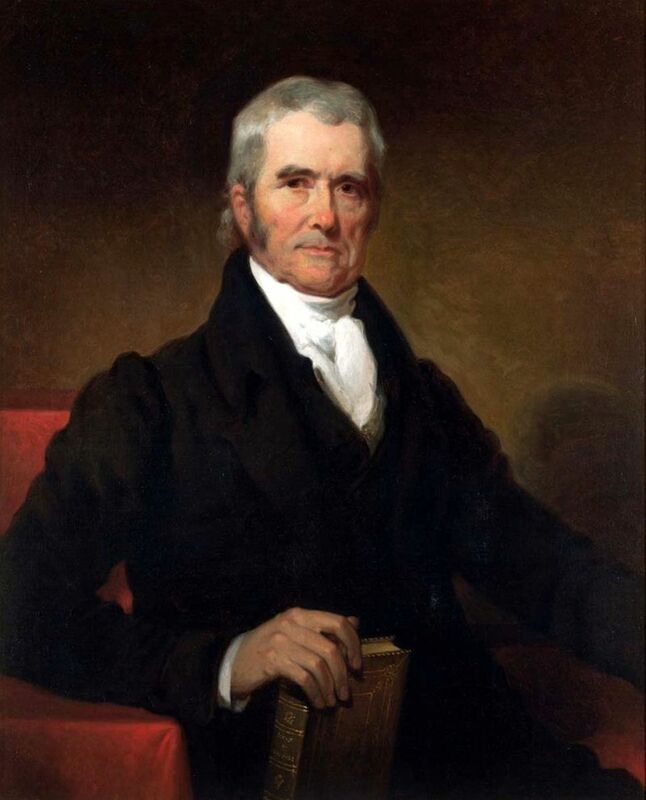 John Marshall was extremely important in the development of the legal system of the United States of America, helping to lay the basis for United States constitutional law and make the Supreme Court an equal branch of government with the legislative and executive branches. Over his long career in government, from 1782 to 1835, he served in the House of Representatives, as secretary of state under President John Adams, and as the fourth Chief Justice of the Supreme Court. John Marshall was born in a log cabin on the rural Virginia frontier on September 24, 1755. 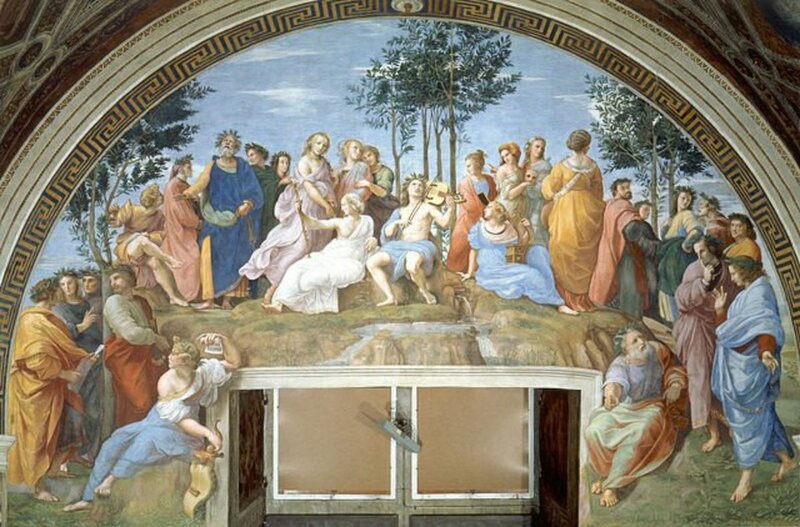 He was the eldest child with eight sisters and six brothers. Since there were no schools on the frontier, he was homeschooled by his parents. At age 14, he was sent about one hundred miles from home to a boarding school for a year. There, one of his classmates was James Monroe, who would one day be president of the United States. 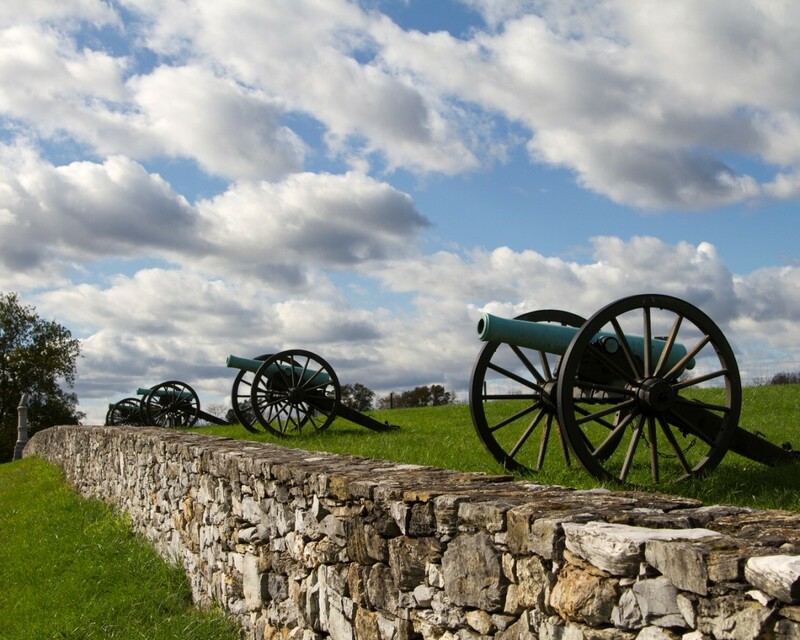 During the Revolutionary War, he served as a lieutenant in the “Culpeper Minutemen” and later was promoted to Captain in the 11th Virginia Continental Regiment. He was friends with fellow Virginian George Washington and became acquainted with Alexander Hamilton. After his military service, he studied law under George Wythe at the College of William and Mary at Williamsburg, Virginia. Marshall became a lawyer in 1780 and moved to Richmond, Virginia. He soon earned a reputation as one of the best lawyers of his day with his ability to make convincing arguments based on logical conclusions gathered from the evidence. Marshall entered political life in 1782 in the Virginia House of Delegates where he served two terms. He was one of the delegates to the Virginia State convention that ratified the Constitution of the United States in 1788. Marshall was aligned with the Federalist Party, along with members Alexander Hamilton and John Adams, which supported a strong national government. On the other side of the political divide were members of Jefferson’s Republic Party, which advocated for states’ rights and the farmers. Marshall played an important role under President John Adams in helping to prevent a war with France. In May 1797, France released a statement that they had ceased to view the United States as a neutral nation and believed it to be a close ally of the British Crown. The statement also threatened that France might even stop treating the American ships as neutral. Sensing the potential of grave political turmoil, Adams called for Congress to form a provisional army to be prepared for war. This decision by Adams faced strong criticism from his vice president, Thomas Jefferson. Less than a month after Adams’ call for preparedness for war, it was reported by the then state secretary, Timothy Pickering, that over the last year French vessels had already attacked 316 American vessels. Due to the lack of a strong military force and his desire to avoid war, Adams tried to make France understand that the United States was a neutral power. At the same time, he refused to ally with Britain. This was done to shield the countrymen from the international political disputes, as he believed that if the United States became involved in the war, unnecessary infighting would start among the citizens on the grounds of being either pro-French or pro-British. In the latter half of 1797, Adams sent a delegation team of three members—John Marshall, Charles Pinckney, and Elbridge Gerry—for peace talks with France, but the mission failed. This news astounded the Republicans and they argued that the Federalists, being pro-British, had undermined the delegates, and they demanded that all diplomatic correspondences be made public. Adams knew there was no foul play in the negotiations with France on the part of the Americans and that the Federalists had nothing to hide. It was revealed that the French government officials only met briefly with the American delegates and demanded a large bribe, an apology letter from the president, and a sizable loan to the French. The American delegation refused the French demands and ended the negotiations. Due to the length of time required for communication to travel across the Atlantic Ocean, Adams did not learn of these demands until a dispatch arrived on his desk in March of 1798. The members of the Adams cabinet were split; some demanded a declaration of war with France, while others called for an alliance with Britain. 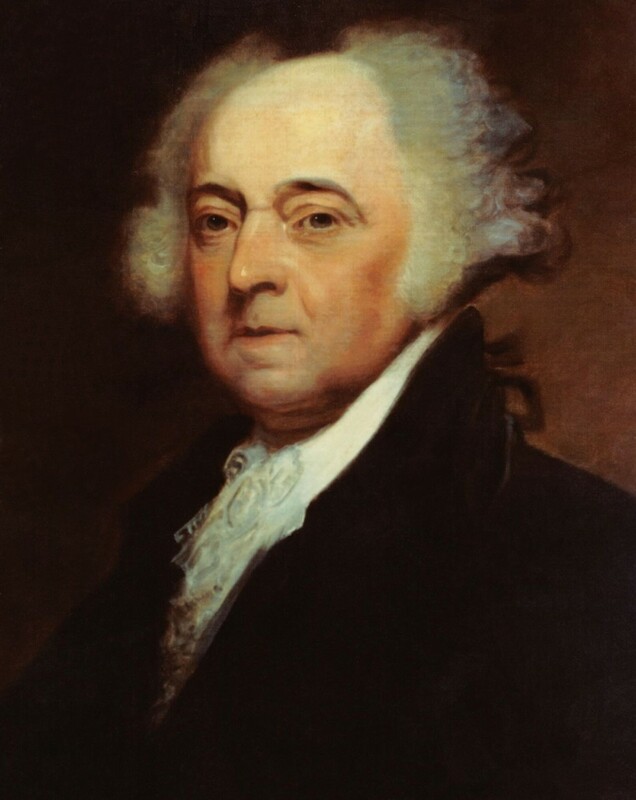 Adams decided to continue to negotiate for peace while preparing the country for a possible war. Congress demanded that details of the negations with France be made public, and Adams complied with the request but redacted the names of the French envoys form the material and referred to them only as W, X, Y, and Z. Hence, the incident would become known as the XYZ Affair. Congress declared that all treaties with France be void and ordered that the French armed vessels be captured. An undeclared naval war broke out. The small United States Navy, with the support of private entities, captured around eighty French flag-bearing ships. In reaction to the actions of the French, in the summer of 1798, Congress passed four bills that became known as the Alien and Sedition Acts. Against his better judgment, Adams signed the bills into law. The Alien Act authorized arrest and deportation of any French immigrants involved in "treasonable" activities. The Sedition Act was controversial as it authorized imprisonment and imposing fines on anyone who wrote, spoke, or published anything that was false and maligned the government. Though the Alien Act was never imposed, the Sedition Acts was used in a few cases to prosecute Republicans. Vice President Jefferson and John Marshall vehemently opposed the acts and argued that they were unconstitutional. These acts were allowed to expire in 1800. 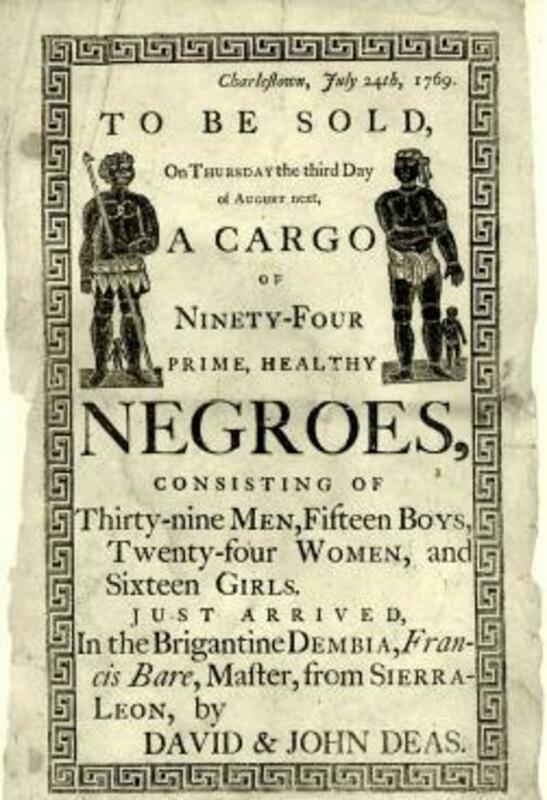 Historians have often criticized Adams for allowing such acts, which squashed the freedom of speech. In 1799, Marshall served in the U.S. House of Representatives for a short period before being appointed as secretary of state by President John Adams. Marshall served a brief and uneventful term as secretary of state leading up to the 1800 elections, when John Adams was soundly defeated by Thomas Jefferson. Adams, hoping to salvage some power for the Federalist Party, appointed numerous Federalist judges to the nation’s courts in the final days before he left office. One of the appointments was for John Marshall to become the chief justice of the Supreme Court. Once approved by Congress, it didn’t take long before the other justices came to respect the new chief justice. 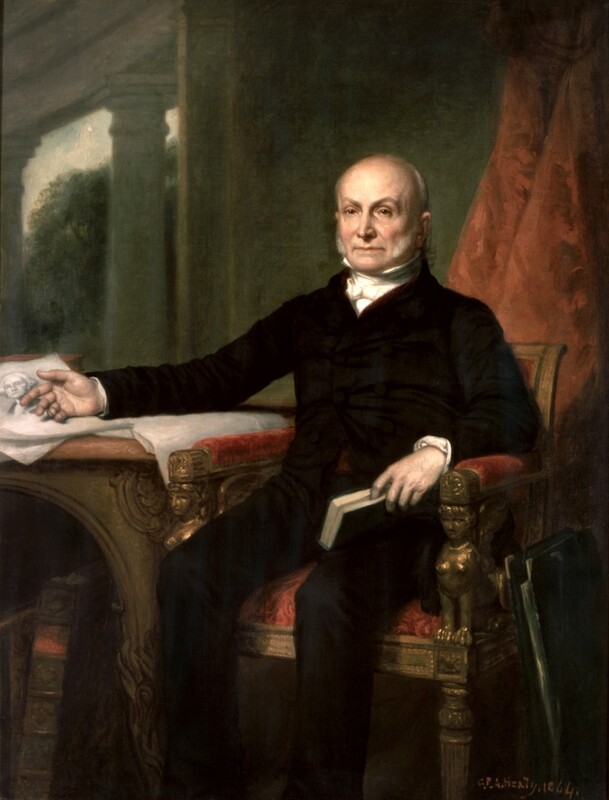 Another appointment by Adams was that of William Marbury as the new justice of the peace for Washington, D.C. This appointment would become very controversial a couple of years later. The Supreme Court was very different at the beginning of the 19th century than it is today. Then, the Court met in Washington only two months a year, from the first Monday in February through the middle of March. For six months of the year, the justices served circuit duty in states where there were cases that required their attention. Marshall’s home for most of the year was in Richmond, Virginia. When he traveled to Washington for Court, he and the other justices boarded together in the same rooming house, and discussed each case in detail amongst themselves. Lawyers would present their cases to the Court and decisions were made quickly, typically in a matter of days. Since the justices did not have clerks, they had to listen intently to the oral arguments and take notes as needed. After weighting the evidence and past legal precedence, the justices issued only one opinion. 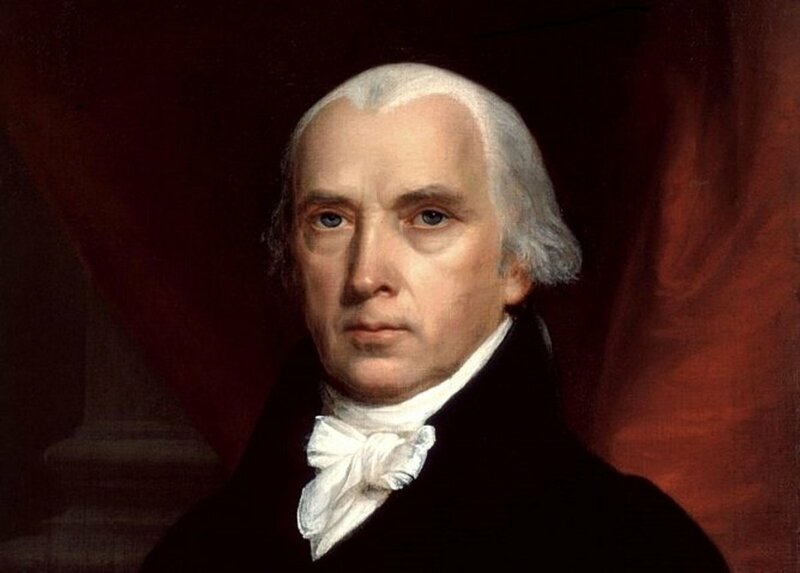 The first major case confronting the Supreme Court with Marshall as the chief justice was Marbury v. Madison in 1803. In a political move, President Thomas Jefferson ordered Secretary of State James Madison not to deliver Adams’ last-minute justice of the peace commission to William Marbury, a land speculator in the District of Columbia. To obtain his commission, Marbury petitioned the Court for a writ of mandamus, which would force the delivery of the commission. After the Supreme Court heard the case, they denied the writ while it agreed that the petitioners were entitled to the commissions. Marshall held that the Constitution did not give the Supreme Court the power to order writs of mandamus. A writ of mandamus is the order from a court to an inferior government official ordering the government official to correctly perform their official duties or correct an abuse of discretion. The Court declared unconstitutional that part of the Judiciary Act of 1789, which gave the Court the power to issue these writs. This ruling established the principle that the Supreme Court could declare an act of Congress void if it was inconsistent with the Constitution. The Marbury vs. Madison case was a landmark case that established the basis for the judicial review of executive and congressional actions on the grounds of their constitutionality. Another important case came up three years later in the trial of the former Vice President Aaron Burr. Marshall was no friend of Burr, as he had killed Marshall’s friend Alexander Hamilton in a duel in the summer of 1804. Even though Burr had killed Hamilton in the famous duel, Burr’s political career was over. Burr became erratic and embarked on a mysterious trip down the Ohio and Mississippi rivers, gathering followers and arming them for a potentially subversive purpose. Burr’s actions caught the attention of the federal government and a warrant was issued for his arrest. Burr was eventually caught and accused of treason for attempting to establish a new country in the Louisiana Territory and Mexico. President Jefferson was furious with Burr and called for him to be tried for treason. At Burr’s trial, Marshall insisted on the principle of “innocent until proven guilty,” arguing that the talk of rebellion and the act of carrying out a rebellion are two distinct things. He ruled that it was necessary to prove an act of treason by the sworn testimony of at least two witnesses. Marshall reasoned that he had not committed treason since he had not engaged in an act of war witnessed by at least two people. Burr was tried on a lesser charge, of which he was found not guilty. Once again, Marshall had identified the Supreme Court as interpreter of the Constitution and limited in its powers by the Constitution. 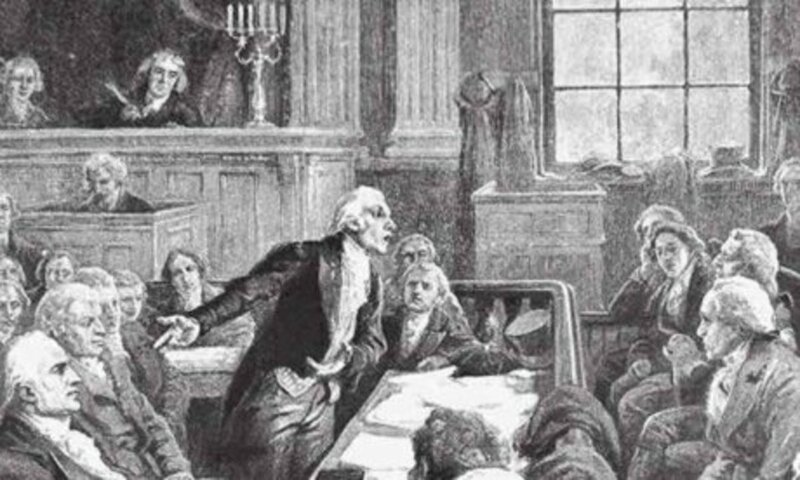 The trial of Aaron Burr brought together some of the finest lawyers in the country to argue the case—where the right of due process and protection for the rule of law were at stake. During his lengthy career, as chief justice of the Supreme Court, he would serve during the administrations of six presidents: John Adams, Thomas Jefferson, James Madison, James Monroe, John Quincy Adams, and Andrew Jackson. In 1782, he married Mary Willis Ambler and during their long marriage they had a total of ten children. The lived most of their married life in Richmond, Virginia, in a home he constructed in 1790. Marshall was an admirer of George Washington and between 1804 and 1807 he published a five-volume biography of the former president. His book, Life of Washington, was based on papers and records provided to him by the Washington family. An abridged edition of the biography appeared in print three years after his death. In 1831, his wife died and he began to suffer from health problems, and his mental condition began to deteriorate. His health would continue to fail and he would travel to Philadelphia for medical treatment and die there on July 6, 1835. The John Marshall Law School was set up in 1899 in Chicago in honor of the former chief justice. In 1955, the United States Postal Service issued a stamp in his honor. Boatner, Mark M. III. Encyclopedia of the American Revolution. David McKay Company, Inc.
Corwin, Edward S. John Marshall and the Constitution: A Chronicle of the Supreme Court. Volume 16 of The Chronicles Of America Series, 1920. Fuller, O.E. Brave Men and Women: Their Struggles, Failures, and Triumphs. Chapter XXVIII. 1884. West, Doug. John Adams – A Short Biography. C&D Publications. 2015. West, Doug. Thomas Jefferson – A Short Biography. C&D Publications. 2016.